1754305, Gunner, 97 th H.A.A. Regt. Royal Artillery (3rd Battalion. The London Scottish). Died 10 October 1941 age 31. He developed Rheumatic Fever during initial training at Rhyl in North Wales . After the 97th were transferred to Clapham Common, London he caught pneumonia. He was taken to the Royal Free Hospital and died there. Buried St. Mary’s Graveyard, Leigh. The funeral took place on Wednesday at Leigh church of Mr George Henry NIXON , of 11 Powder Mills, who died on Friday, aged 31 years. Born 10th October 1910 in Leigh. The eldest son of Charles and Elsie Nixon who had a family of five daughters and two sons. He lived at the Powder Mills with his parents and worked as a gardener in Hildenborough. His brother Gilbert was killed in the war six months later. 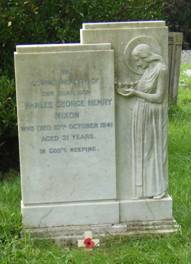 In loving memory of our dear son Charles George Henry Nixon who died 10th October 1941 aged 31 years. In God’s keeping.